Written by Angela Natividad on AdRANTs: Not all advertising for the Beijing Olympics is pretty and nice. 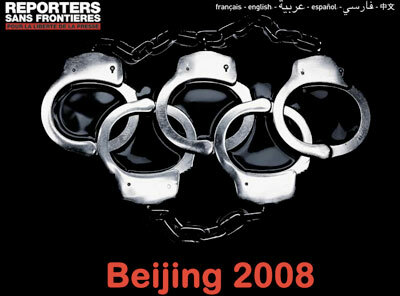 Reporters without Borders is disseminating this image to remind Olympic fans how China treats reporters, activists and bloggers. The home of the Great Firewall is under pressure to open the ‘net to journalists during the Games. “I’m satisfied that the Chinese understand the need for this and they will do it,” said Vice Chairman Kevan Gospar of the International Olympic Committee’s coordinating commission. This entry was posted on April 7, 2008 at 7:31 pm and is filed under Uncategorized. You can follow any responses to this entry through the RSS 2.0 feed. You can leave a response, or trackback from your own site.